The human ability to think in abstract terms is often cited as one of the key differences between our species and those in the rest of the animal kingdom. Our love of art and visual depiction can be traced back to the Late Palaeolithic but the thought that since cave paintings are confined to France and Spain, therefore art began in Europe, has been challenged thanks to an amazing discovery on the Indonesian island of Sulawesi. A joint Australian and Indonesian team of anthropologists have uncovered a series of ancient human hand stencils and paintings of animals in seven cave sites in the southern portion of Sulawesi island. Although a rural location, these caves (Karst Maros) had been visited by a number of tourists and backpackers, but until now nobody knew just how old some of the paintings were. Archaeologists and palaeoanthropologists had long been puzzled by the appearance in southern Europe around 40-35 thousand years ago of a rich and varied range of artwork, including rock paintings and carved figures, but the absence or scarcity of similar art found elsewhere in the world. Homo sapiens migrated into southern Asia and the Far East but little evidence of any form of culture in terms of works of art has been left behind on these migration routes. Using a dating method that is based on the radioactive decay of uranium to thorium in small mineral growths that had formed on the paintings, the scientists were able to determine the minimum age of the paintings. One hand stencil has been dated to circa 39,900 years ago, making it the oldest human hand print known to science. A painting of a wild pig, an animal probably hunted by these ancient humans, has been dated to at least 35,400 years ago. The artwork and images had been created by using red ochre, the materials and painting techniques used seem to be very similar to those found in caves of a similar age in western Europe. This new research suggests that the rock art traditions seen on Sulawesi are at least as old as the oldest known European art. One of the implications of this new study is that it has now been demonstrated that humans were producing very similar types of rock art by 40,000 years ago but at opposite ends of the Pleistocene Eurasian world. Cave paintings at least 35,400 years old with hand stencils at least 39,900 years old. 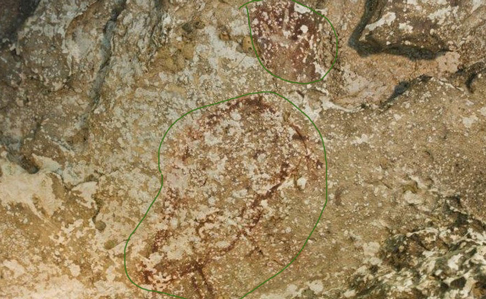 The artwork is very faded in the above photograph, so we have circled in green the rock art that was studied. It is feared, that just like the cave art in some European caves, modern pollution could damage these ancient Indonesian drawings. The scientists hope to use this radioactive dating technique to accurately date other rock art sites in Asia and Australia. By doing this they hope to better understand human migration and the movement of abstract ideas through the ancient population as it migrated eastwards.